You are currently browsing the tag archive for the ‘Cape Town’ tag. Now is his chance indeed: let him who would speak, speak. But he stands tongue-tied, the blood thudding in his ears. A viper: how can he deny it? ‘Excuse me,’ he whispers, ‘I have business to attend to.’ Like a thing of wood, he turns and leaves. Well folks, I am back. Yesterday was a fantastic day, spent with friends, family and my beautiful bride on a stunning headland by Austinmer beach overlooking the Pacific ocean. It could not have gone better. Stephanie and I had the opportunity to renew our vows in the company of people we wished could have come to our first wedding in Ireland – so instead we brought the wedding to them. I was free to enjoy the day and its festivities thanks to the sterling work of my fellow bloggers who agreed to lend a hand with ‘A book a day’, this week. Take a bow you folks. I am extremely grateful to you all. So back to the business of book blogging. David Lurie is a Cape Town college academic more suited to expounding on his theories about Romantic poets such as Wordsworth and Byron through his writing, than actually teaching students. However, his published books have failed to attract any acclaim and his frustrations with his classes aside, it does provide him with an income. With two failed marriages behind him Lurie instead indulges in affairs with college staff, or spending his time with prostitutes, for sexual relief. Inevitably his overly analytical mind ruins whatever pleasure he may gain from these encounters. Then Lurie embarks on an affair with an eighteen-year old student, which leads to an official complaint from her family and a disciplinary hearing. Refusing to engage with the process, as he sees it as a forced confessional, the professor instead agrees to leave the university. He travels to his daughter Lucy’s home, an isolated farm in the wilds of the Eastern Cape. Lurie remarks upon her vulnerability to attack living in such a lonely place, but she insists that she has found meaning her. She cares for a number of dogs and introduces her father to Bev, a local woman who euthanises those pets that have been too badly wounded, or are too sick to survive. Lurie dismisses their concerns for animals as inflated sentiment. His daughter in return rejects his emphasis on abstract thinking and academic concerns. However, when the farm is attacked, both father and daughter are confronted with their own powerlessness and react in very different ways. Nominally the title of this book refers to the professional misconduct of Lurie. J.M. 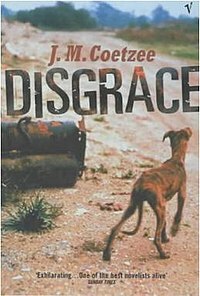 Coetzee narrates his protagonist’s increasing disenchantment with his life that has led him to the disciplinary impasse with the college board, his refusal to ‘confess’, a product of his own confused feelings on the affair. In his mind his encounter with the student came as a result of passion, something his own ex-wife dismisses by pointing out that no young woman wants to see a man of his age in the throes of sexual climax. Indeed Lurie seems to lust after the student’s youth more than anything. When he later sleeps with someone closer in age to himself he is initially disgusted by her body, but then continues the relationship. It is not like anyone else wants him. However, Lurie also later feels disgraced by his inability to protect his daughter. Coetzee draws an odd parallel between his refusal to engage the board and Lucy’s to speak to her father about what happened. In effect, the author tells us the woman who had embraced life in the countryside has been beaten by it. It takes the rarefied academic longer to realize the same. This book left me angry. Its characters are defeated by life and Lurie’s sub-Yeatsian carping about noble minds tied to aging bodies I could not take seriously.